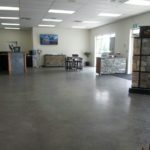 Our Burnaby location houses our Showroom, and a 6,000 sqft warehouse. The showroom features all of our thin veneer profiles. In our warehouse we carry thin veneer, full bed and landscaping materials. From Vancouver: Travel East on HWY 1 and take the Willingdon exit. Head North on Willingdon then turn right on Lougheed Highway (East). Turn right onto Holdom Avenue and left on Kingsland Court to enter our parking lot. We are located directly beside Windsor Plywood. From the Fraser Valley: Travel West on HWY 1 and take the Kensington exit. Head North on Kensington and continue onto Sperling Avenue then turn right on Lougheed Highway (West). Turn left onto Holdom Avenue and left on Kingsland Court to enter our parking lot. We are located directly beside Windsor Plywood. Marina Zimmerman is our Vancouver location Facility Manager and Sales Representative. She completed her BBA at Simon Fraser University in 2011. Marina has been working with K2 Stone since February 2014 and spends most of her time in the store and travelling to jobsites in the Fraser Valley. If you need a quote or would like to discuss an upcoming project please call Marina or visit her at the Vancouver Showroom. Kyle has recently joined K2 Stone in the sales and warehousing roles of the Vancouver Store. He has completed his BBA in Marketing Management from Kwantlen Polytechnic University; and has been working as a sales consultant prior to K2. Kyle is actively involved in the dance community in and around the Vancouver area, where he sometimes teaches, DJs and volunteers at social events. Additionally, he loves sports, travelling and spending time with family/friends. Lenea is the newest member of the K2 Stone Vancouver Team, she graduated from BCIT in 2009 with an Interior Design Management Certificate. Prior to joining K2 Stone Lenea worked as a colour consultant and interior decorator with Benjamin Moore. In her spare time Lenea enjoys hiking with her dog, going to the gym, remodeling furniture and spending time with friends and family.